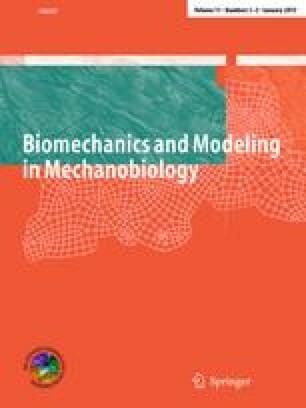 The objective of this work is to address the formulation of an adequate model of the external tissue environment when studying a portion of the arterial tree with fluid–structure interaction. Whereas much work has already been accomplished concerning flow and pressure boundary conditions associated with truncations in the fluid domain, very few studies take into account the tissues surrounding the region of interest to derive adequate boundary conditions for the solid domain. In this paper, we propose to model the effect of external tissues by introducing viscoelastic support conditions along the artery wall, with two—possibly distributed—parameters that can be adjusted to mimic the response of various physiological tissues. In order to illustrate the versatility and effectiveness of our approach, we apply this strategy to perform patient-specific modeling of thoracic aortae based on clinical data, in two different cases and using a distinct fluid–structure interaction methodology for each, namely an Arbitrary Lagrangian–Eulerian (ALE) approach with prescribed inlet motion in the first case and the coupled momentum method in the second case. In both cases, the resulting simulations are quantitatively assessed by detailed comparisons with dynamic image sequences, and the model results are shown to be in very good adequacy with the data.